Having Trouble Starting a Food Truck? So, you have decided you want to start a food truck. Awesome! But now what? Just like a traditional brick- and–mortar business, research and planning is essential for success. Being a food truck owner is just like being the owner of any other business- it won’t succeed by simply knowing how to cook and finding a truck to buy. You have to understand the needs of your neighborhood, understand how to choose the right food truck, the importance of marketing your food truck business, and so much more. What if it was possible to get information on the needs of the local market, details on selecting the right truck for your specific needs and budget, the best connections for sorting the insurance needs you will have for your new truck, a plan for successfully marketing your individual truck in order to reach your optimal audience, and so much more…all in one place? 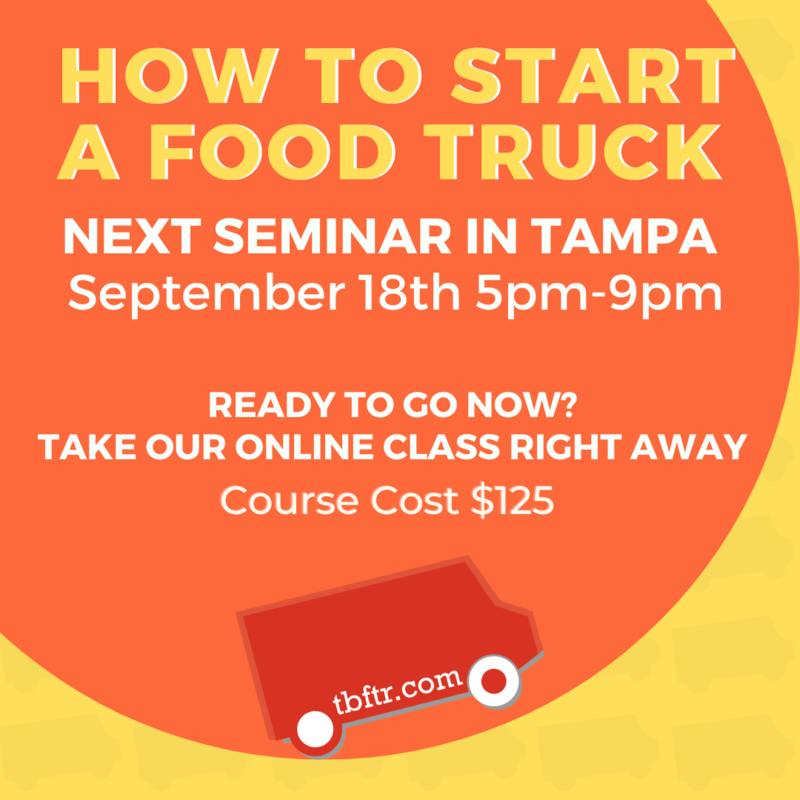 Our Tampa Bay Food Truck Rally Starting a food truck seminar does just that…and more! The Tampa Bay Food Truck Rally seminars are designed to inspire, inform, and educate potential entrepreneurs in regards to what it takes to not only start, but also run and maintain a successful food truck. Understanding the importance of the choices you make along your journey to entrepreneurship, what regulations typically exist in the industry, and the importance of the way you position yourself and your business for success before you even have your first customer. You can register online for our summer seminar in order to secure a spot. The seminar is streamed online so that anyone who is interested can attend from anywhere in the world, and will have the opportunity to interact just as if they were in the room (unfortunately though, online participants will not be able to take part in the dinner that is included for in-person attendees). “However all online attendees will have the same opportunity to ask questions and have them answered as the in person attendees. Regardless, if you just started thinking about food truck ownership yesterday, or have started taking the first few steps, this seminar is for you. Be sure to register today! If you have any questions, you can contact grace@tbftr.com or call (813) 802-9119.